SMRT is based on object-oriented programming e.g. the snowpack is an object, so is the sensor (radiometer or scatterometer). This makes it easy to interface modules. 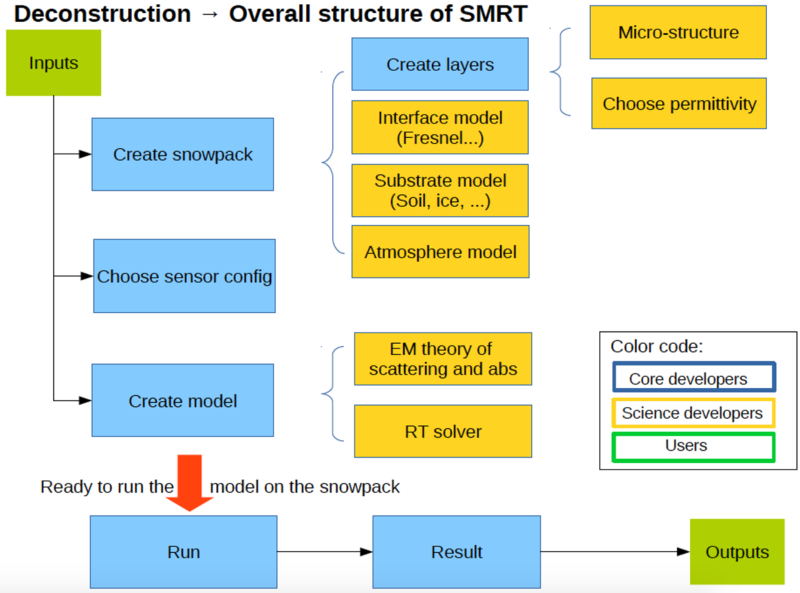 The image on the right illustrates the structure of SMRT. Users will be interested mainly in the inputs and outputs shown in green and have no need to look at the internal mechanics of the model. Modules of interest to the science developers are shown in yellow. Changing these changes the scientific assumptions used in the model. Please make changes to these, add new things and feed your work back into SMRT. Items shown in blue form the backbone of SMRT and do not contribute to the science. SMRT allows flexible inputs so there should never be any need to touch these. Changes to the core modules may break SMRT, so please contact us if you wish to make changes to them. Have a play! The easiest way to start is to take an existing file e.g. iba.py and copy it in the same folder. You can then make changes to your new file. As long as the outputs are of the same format and there is no problem with the code (see Testing below) then you should be able to use your module with no additional installation steps. For example, to switch from IBA to YOURNEWTHEORY electromagnetic module, you can just use the new file name in place of 'iba' e.g. You can then see the documentation in the smrt/doc/build/html/ folder. Note that there are currently some issues with the Windows-Ubuntu OS. We use the nose testing framework. Please write tests to check your code performs as you expect it to. Tests for a module are stored in the same folder and given the name test_yourmodulename.py. will automatically discover the tests in your file and run them. Running nosetests in the main smrt folder will run all tests in its subfolders. See nose for more information. It's also worth looking at the tox package for testing on all supported versions of python, and the tissue package for ensuring PEP008 style compliance. Commit changes to your local repository (a simple guide to git). Once you are satisfied your module behaves as you expect, or if you have improvements to make to existing modules, please submit a pull request to the SMRT repository. Contributors to the git repository will be posted here in the future!